What happened to the "Events" section? Well no one sent me any dates. I had to go and look for them all over the place. It wasn't a problem in the early days, but now I am just too busy. I thought the FAQ section would be more useful instead. Would you have the "Events" section back? Sure, but as long as I find an easier way to gather the information I need. If you know of any-where that I can look this up, or maybe one of you would be kind to send me all the dates for Military & Radio Rallies or Hamfests in Europe, England, and USA, I will publish it. I love your website, who is the designer? Well I am. In my previous life I was working for over 15 years as a computer systems administrator and designed websites for other people. Radios were just a hobby back then. I hate your website, why does it capture my browser? There is nothing I can do about this. It is due to a script that keeps the various page frames of the website together. With-out this script if you were to come from a search engine, you would just see a page with no menus on the left or the logo on top. Believe me it is not done deliberately!. Usually to over come this you can click a few times on the back button in quick succession to go back were you were, before you came to this website. Can I use some of your radio pictures on my web site? Yes you can use some of our radio pictures on your web site. Please ask me for permission first. You must also state somewhere on your web page that the pictures are used, where the pictures came from and a link back to our website www.armyradio.com. For example "The following pictures provided curtsy of Army Radio Sales Co.", or something to that effect. Please do not use our radio pictures with out our permission and link back. It is not professional. Yes you can, please feel free to link to our website. Don't forget to let me know. Can you list my website in your links page? Sure, no problem. Send me your link. I will place your link in our "Links" page as long as your website is relevant to Army Radios or Military vehicles. I have written an article, can I publish it on your site? Yes you can, as long as it is relevant to Army Radios and Military Vehicles. You will have to send me your Article along with Pictures. I will change the layout and the way it looks to conform to Army Radios website before publishing. Would I get credit for my Article? You sure would. I can even publish your picture along with your article and give credit to whoever who helped you with your article. You can also have your email address and your URL to your website. How much do you pay for an Article? We do not pay for Articles. The Articles section is a free service to serve the need of the collectors and radio amateurs. We do not make money on your Articles. It even costs us money for disk space, and my time to rework the articles for publishing. Can I send you some other person's Article to Publish? You can send me some others persons Article to publish as long as you have the original authors permission to do so. If I get my article published on your site, who holds the copyright? The Articles author would keep the copyright on the original text and pictures that were submitted. Army Radio would hold the copyright for the layout and the way the Article looks on our website. Have a look at some of the Articles already published. What format should I send you my article to publish? You should send me your Article in Electronic format. I would be able to read and work with almost any PC file types. You can send your Article as attachments with email or if it is already published on your web site, send me the URL. In certain circumstances you can send me all the physical paper work. As long as the text is printed I would be able to scan the pictures and OCR the text. Please do not send hand written text. I would not have the time to re-type your text. What size pictures would you prefer for my Article? I would prefer colour pictures 640*480, but any size picture is fine. I will resize and edit the bigger pictures as necessary. How long will it take you to publish my Article? It all depends on how busy I am and how large your Article is. Articles in Electronic format would be quicker to get published. From past experience it can take from as little as few days to as much as few months to get your Article published. Would I be able to Link to my Article which is on your web site? Of course you can link to your Article which is on our web site. After all it is your article. After you have published my Article, would I be able to use it on my website? Army Radio holds the copyright to the layout and looks of the Article. You should not copy the pages and use them on your website. It usually takes me a few days work to get your article to look the way it does. This is not a free web design service. You can link from your website to your Article that is OK. Don't forget, you hold the copyright on the original text and your pictures. You can publish your article on your website as long as it does not look like the Army Radio version. I think that is only fair. Can you start my Article access Counter on xxxxx? No, a new articles access counter will have to start from "0"
I have noticed a mistake in one of your articles, who do I tell? Please tell me and the articles author about the mistake. Also tell us in which article and where in the article you found the mistake and the corrections. Corrections to the article would be done as soon as possible. Can you place a link to my Article which is on my website? I can place an External Link to your article from our "Links" page only. I can not place an External Link to your article from our "Your Articles" section. If you have an article and want it to be published on Army Radio's website, you will have to send it to me to be edited and it has to live on our website. I hate broken Links. Why must my Article live on your website? Your article if it is published on our website has to be redesigned to conform to Army Radio's look and feel. Also I hate broken Links. If you move your web server and don't tell us, no one will be able to access your article. Just look at any Links page on any web server, there are always broken links. How can I sell something on your web site? There are two ways of selling your equipment on our web site. First is through a listing in the Classifieds Ad's section which is free to private individuals. The second is to list your radio in our "For Sale" section. You will have to send me all the details along with pictures and I would list it in the "For Sale" section. We charge only 15% of the selling price for this service. Is listing something in your Classifieds Ads section Free? It is completely free to submit a private classifieds advert, as long as you are not a dealer. All adverts are seen in real time and goes on line as soon as you submit it. Please only submit relevant items, Military Radios and Military Vehicles. I am a surplus dealer, can I list something in your "Classified Ads" Section? If you are a dealer you can advertise your equipment in our "Classifieds Section". This is not a free service to dealers. It would cost you £5 Pounds for 30 days of exposure per advert. Can I list my equipment in your "For Sale" section to sell? Any one can sell their radio in our "For Sale" section. To sell your radio you will have to send me all the details along with pictures and I would list it in the "For Sale" section. We charge only 15% of the selling price for this service. Please email me for more information. How much do you charge to list my equipment in your "For Sale" section? We charge only 15% of the selling price of the equipment for this service. Please email me for more information. Do you always have all the equipment in stock? Not necessarily, some of the radios and the equipment that we show are so rare and very hard to find in quantity. We get what we can, when we can. Sometimes they were part exchanged with other equipment. But generally we have in stock most of the equipment that we display, but you should always email us before placing orders. Does everything you sell work? Most of equipment we sell is functioning. When an order is placed the equipment in question would be given to our technician so he can check it over before it is boxed and shipped. Some equipment we simply can not check for the lack of cables or a suitable power supply. These are sold as untested. If the equipment is sold as Untested does it mean it doesn't work? Untested equipment is really untested. We would never knowingly sell anything which we know doesn't work. Sometimes it is just not possible to test the equipment. We may not have a suitable power supply, the correct cables or the connectors. If I know it doesn't work I will tell you before you place your order. Would I be able to repair that? You need to have good understanding in Electronics and Fault finding, be able to read a circuit diagram and have some basic electronic tools. You would be able to repair or restore any radio. After all it is all part of this fascinating hobby. Collection and restoration of old Military radios is all good fun. Become a member of a Ham Radio Club, a few minds is always better than one in solving a problem. Do you guarantee the equipment? If you have bought an item which is classified as in tested working condition, then you have a few days after you receive it to let us know of any problems. We can replace or repair that item free of charge. But generally we can not guarantee old and obsolete equipment. Don't forget some of this equipment is more than 60 years old. If there is a problem we always offer to help and solve the problem the best way we can. Do you service the equipment to the Manufactures Specification? We check the equipment to make sure they are working satisfactory and make sure it is complete and in good working condition. We do not have the time to align or service the equipment to the manufacturers spec. Some of this equipment is more than 60 years old. Some of the components could have changed value over the years. It is very time consuming to check every component and to service the equipment to manufactures spec, which would push up the prices. This part we leave to you. It is all part of this fantastic hobby. We have given you a head start by making sure the equipment is working, the rest is up to you. I was servicing my radio and have messed it up, can I send it back? Please email me first to see what can be done. Generally if you open something and thinker with it in any way, it is down to you. Of course I will always help out if I can. How do you grade the equipment? Grade 1 Brand New New or unused, new old stock or as new. In working order and operationally checked. Grade 2 Tested Tested and in working order, operationally checked. Grade 3 Untested / Repairable Untested but could be working, or can be repaired and is Electro-Mechanically complete, but may require some troubleshooting by the customer. Grade 4 As Is Un-Checked, could be complete and/or paint work might look rough, and/or might have some parts missing. Grade 5 Incomplete Good for parts or scrap, could have been smashed or some parts removed by the army. I have just received the equipment, I can't get it to work what can I do? Email me first, ben@armyradio.com, I will try to help. If when you receive the equipment and with in a few days you find it doesn't work and it was bought in Tested / Working Condition and there is nothing that you are doing wrong, then probably the equipment is faulty or was damaged in transit. You can send it back for replacement or repair, but email me first. Could anything have happened during shipping? Yes, Tubes or Valves could have been dislocated from sockets or even broken. Plugs and sockets working loose and Dry Joints. It is always worth checking the equipment before plugging it in. We pack the equipment very well for shipping, but when the parcels leave here all sorts of nasty things could happen to them on the way to you. Is there anything I can do to check the equipment? Yes, but email me first. Shipping process is not very gentle on radios. Check for broken Tubes or Valves, Loose Plugs and sockets, and Dry Joints. Why don't you publish prices? For good reason! Not publishing prices on some equipment forces our customer to email us first. We can then establish the availability, condition of equipment and the cost of shipping before any payments have been made. Another good reason for not publishing prices is the lack of availability of some equipment. This forces us to obtain the same equipment in small quantities from different suppliers and in different countries with different costs for the same item. I simply would not be able to keep up with updating the web site every day, not to mention the exchange rates which changes every day. What sort of Military radios do you sell? We sell collectable old obsolete military radios and accessories. Some of these radios are more than 60 years old. Some that has been used in W.W.II and other wars. We sell radios to collectors, re-enactors, military vehicle owner, restorers, and radio amateurs. 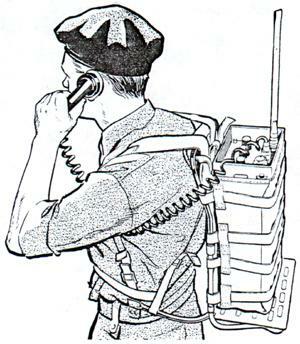 What sort of Military radio don't you sell? We don't sell newer radios that are still in service. We can only sell what has been released onto the surplus market. Why don't you sell newer radios that are in service with the military? I can only sell what is available on the surplus market. We can not get hold of newer equipment that is still being used by the military. If they release it, I can sell it. Who do you sell radios to? We sell radios to collectors, re-enactors, military vehicle owner and restorers and of course the radio amateurs. Who don't you sell radios to? We don't sell equipment to unfriendly governments, or companies who would sell on the products to unfriendly countries or governments which oppress their people. We don't sell to terrorists, private armies or other types of people engaged in this activity. These old radios are for fun and hobby use only. Our shop is on the Internet. We don't have a physical shop were people can come and see the equipment. This is a mail order business only. Why don't you have a shop? We are based in England. It is very expensive to have a big shop to keep everything, especially in London where I live. In recent years we have seen many surplus dealers closing shop and moving on to other things. This is due to the high costs of running a shop. To keep costs down to minimum I have decided against a shop for the time being. Remember, higher costs=more expensive radios. The other reason is if we had a shop we would have to stay open every day and I have to be there to run it. This is not very practical for me as most of the time I have to travel to other countries to find the Equipment that we sell. Some times I am away for a week or so. So I have to find some one to run the shop while I am away but that would result in even more costs. Were do you keep the equipment if you don't have a shop? We have a large warehouse which is outside London, it is actually about 2 hours drive away. It is not very convenient but it is much cheaper to rent. A place like this in London would have cost me 4 times as much! If you don't have a shop, were does your Technician work from? My technician works from his workshop not too far from here. I take him the radios to check over and when they are ready I collect them from him. I may even work on some radios my self, depends on how busy I am. For small amounts it is cheaper if you send me cash in a registered or recorded delivery mail. Cash payments are only accepted in Pounds Sterling, Euros and US$. Our bank does not charge us for cash currency conversion. You can also send your payment as International Cheques in Euros and US$, but you will have to add 10 Euros or 10 US$ for my bank's Currency Conversion service. If you live in England you can send me a normal banks cheque in Pounds Sterling. If you have a credit card you can pay us using PayPal. If you pay with PayPal you should pay in Pounds Sterling. PayPal now offers this service. You can also send me your payment with "Western Union's International Money Transfer". We have a Western Union office nearby where I can collect your payment. Can I pay you with my Credit Card? We do not accept credit card payments directly, only through PayPal. If you want to pay with a Credit Card you should use PayPal. We don't have a secure server and I don't want to know any ones credit card numbers, so I let PayPal handle all that. It is the safest way. Can I pay you with PayPal? Yes you can pay us with PayPal. Please pay in Pounds Sterling. Can I send you my payment with Western Union? You can send us your payment with "Western Union's International Money Transfer". We have a Western Union office nearby where I can collect your payment. Can I transfer my payment directly to your bank account? Yes you can transfer your payment directly into our bank account. The payment has to be in Pounds Sterling. I prefer payments in Pounds Sterling then I don't have to worry about exchange rates. You can now send your payment in Pounds Sterling with PayPal. My second choice is Euros and then US$. Can I pay you in US$? If you really have to! Can I pay you with Euros? Euros are better for me than US$. I often travel in Europe and it is handy to have some Euros. Can I send you Postal Orders? You can send your payment using British Postal Orders in Pounds Sterling. Can I send you an International Cheque? As long as the cheque that you are sending me is International and I would be able to pay it into my bank account it is OK.
Do you have COD "Cash On Delivery" facility? No, sorry we don't do COD. It is too hard to arrange COD, especially when sending to a different country. I want to send you cash, what should I do? Make sure cash payments that you are sending is sandwiched in between a few layers of dark paper so that the postal workers would not be able to see what you are sending. Put it in an envelope and send it using registered or recorded delivery mail. Insure the package for the value of cash or even more. If the package gets lost no one would loose out if it is insured. I do not accept responsibility for lost payments sent this way. Where do I send my payment to? You send your payment along with your order to our London Address. Click Here. How can I buy some thing, I don't want my wife to find out? I have come across this a few times! You can call me or email me to discuss the situation. Some collectors smuggle the radios into their house when their wife is away. Others dismantle the equipment and take it indoors bit by bit over a few weeks. Some people hide the radios from their wives in the shed or in the attic or even with a friend. A good excuse is "this is not my radio, it belongs to John and I am looking after it for him". Which Shipping Company do you use? We use UPS, Parcel Force and the Royal Mail. Depending on the weight of equipment, number of parcels and the best shipping rates, we would use one of those Companies. Are the equipment insured during shipping? The equipment being shipped is generally insured for damage or loss during transit. Some low value or special offer items which have a all in one price do not include insurance, unless you specially ask and pay for it. Some items are already checked and ready to be packed and shipped. After we receive your payment and it clears our account, that item would be shipped to you and usually takes about 5 to 7 days. Some items are not checked until we receive your order. These items are then passed to our technician to be checked and usually take about 2 weeks until they are sent off to you. In most cases it would take about 3 weeks until you receive your equipment. Why does your Technician take about 2 weeks to check my radio? He has plenty of other people's radios before yours to check. It all goes into a queue, first in - first out. You can only track the parcels that are sent using FedEx. When your parcel leaves here I will send you the FedEx tracking number. You would be able to track the parcel from FedEx website. Parcel Force does not have on-line tracking facility. Royal Mail does not have any tracking facility at all. Do you charge for packaging? We don't usually charge for small package, but for bigger heavier packages or multiple packages we do charge something for packaging. To minimise damage during shipping, the equipment have to be packed very well. It takes time and a lot of Styrofoam to pack well and the charges depend to the size, packing materials used, and the time taken to pack. Are your packing boxes recycled? To play my part in saving the planet, we send most things in recycled boxes. Who pays the Shipping costs if I am returning something? You pay the shipping costs from you to me. We would pay for the shipping costs back to you. That is a fair way. Can I collect my equipment from you directly? Yes you can, but we have to arrange this well in advance, so that the radio is ready when you come to collect it. You usually can collect from our London Address. I Do not live in England Do I have to Pay import duties? If you do not live in England and are not a member of European Union then you may have to pay import duty. Who do I Pay import duty to? The Shipping Company or Postal Company who delivers you the equipment would do all the paper work for you, and you will have to pay them before they release the equipment to you. You do not pay us. How much should I expect the import duty to be? It all depends to which country the equipment are being imported to. Each country has its own importing rates. The import duty is usually calculated on a small percentage of the invoice value. You should check with your countries customs department, they will be able to advice you better than I can. Do I always have pay import duty? Not necessarily, you may be lucky and the package may slip through, as it often happens. Also if the equipment is made in USA and you are importing it back into USA the US customs department may not charge duty or taxes, as taxes for US made equipment have already been paid, when they were bought originally. "I think", but don't blame me if they charge you! Do I need a radio Licence to operate these radios? You do not need a Licence if you are using a Receiver, or you are using the equipment to receive signals or the equipment is used for display purposes and is not being used for transmission of signal. You need to get a radio licence if you are going to Transmit any types of signal. Best if you get in touch with your countries radio amateur society and the government organizations responsible for issuing radio licences for more information. They will be able to help you with all you need to know. In England please contact RSGB "Radio Society of Great Britain". I don't have a Radio Licence, what may happen if I get caught? Don't use a radio without a licence! If you get caught all your radio equipment would be confiscated and destroyed as well as Heavy Fines and the possibility of few years drinking cold water in jail, which is not going to be a fun place, unless you like bending down for soap! Do I need a licence to keep these radios? You do not need a licence if you are collecting radios and do not use the equipment for transmission. I have a radio Receiver, it does not transmit, would I need a licence? If you have a radio receiver you do not need a radio licence. You only need to get a radio licence if you are going to Transmit. Radio receivers can not transmit. Do I need a licence to listen to my radio? You do not need a licence to listen to radios, just don't transmit. Do I need a Licence to mount a radio in my military vehicle? You do not need a licence if you do not transmit. You can listen to the radio and you can show off the radio in your vehicle, just don't transmit. If I have a radio for show purposes, do I need a Licence? You do not need a Licence if the radio is for show and is not being used as a Transmitter. So, when do I need a Radio Licence? You need a radio licence only when you are going to transmit any types of signal. Were do I buy a Radio Licence from? You can not buy a Radio Licence! You have to do some studying and pass the Amateur radio exam. If you pass the exam, you will get your own call sign. You would then be able to Transmit on designated Amateur bands with out fear. Becoming a Licensed Radio Ham is a privilege. It opens up the air ways for you were you can speak to other like minded people. How do I get a Radio Licence? Please get in touch with your countries radio amateur society for more information. They will be able to help you with all you need to know. In England please contact RSGB "Radio Society of Great Britain". You should also find and join your local Ham Radio Club. They would be able to help you get your Licence. To get a Licence you have to do some studying to pass the Amateur radio exam. If you pass the exam, you will get your own call sign. You would then be able to Transmit on designated Radio Amateur bands with out fear. Becoming a Licensed Radio Ham is a privilege. It opens up the air ways for you, were you can legally speak to other like minded people from all over the world. How do I join a Ham Radio Club? Please get in touch with your countries radio amateur society for information on your local Ham Radio Clubs, then get in touch with the club for more info. There are also many Amateur Radio publications that you can refer to. Being a member of a club is a good start to meet other like minded people. If you are stuck with a problem there is always some one in the club who is probably called "John" and knows more than you do! I live in a weird country under a dictatorship can I keep Army Radios? If you live somewhere weird under a dictatorship, your government probably would not be able to understand why any one would want to collect and keep anything not to mention Military Radios. To them you are a Spy and should be lucked-up or shot! I have heard some collectors are sitting in jails or have even been executed in Iraq ( Iraq may be OK now with Saddam gone), Iran and come to think of it most of Middle East! for just possessing green radios. If you think you have that type of government it is best not to bother with green radios or move out somewhere Free. If you have experienced anything like this in your country, please send me all the details. I would publish your story and shame your government. I have a big radio collection and now my wife has left me, what should I do? You wife has probably left you because you have not paid her any attention. You have lots of radios and you spend most of your free time with your radios. You speak to the radios, clean them, take them apart and work on them. Spend most of your weekends away from home at some far away radio rally looking for that hard to get piece that would complete the radio station that you got 5 years ago. Speak on the radio or the phone with friends and other collectors for long periods. Probably the last straw before she left you was when you moved some radios into the bedroom, only because you didn't have any more room in the house for radios. Need I say more? You have forgotten about your wife. This is what you should do if it is not too late! Get in touch with me and sell me all your radios. That will clear your house from all the radios. Then redecorate the house and with the money you would make from the sale of the radios, buy a couple of tickets for you and your wife to somewhere romantic. Then when you are away on holiday, tell her how much you love and miss her, or words to that effect. Tell her that you have sold all of your radios because you love her, redecorated your home and swear to her that you have given up your radio hobby for ever. That should do it, she should come running back to you at this time. If she still doesn't come back, all is not lost. You now have a newly redecorated empty house. Find a new woman. Don't tell her you are a radio collector. Show her your nice empty house and then marry her. After you are married pretend that you are getting interested in a new hobby and try to get her involved in it. Take her along to a few radio rallies. Soon she would realise how boring the radio rallies are and stop coming. Then slowly start collecting radios again. As it takes many years to fill the house with radios again, say 25 years or so, by the time your second wife realises what she has got her self into you would be too old to care! I hate my wife, how can I make her leave me? See the above answer and do the exact opposite. Quicker you collect radios, quicker she would leave you. Just think of all that space that you would gain when she leaves you. You can start filling some of that space by getting your radios from me.